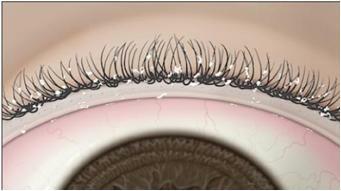 Blepharitis is a common and persistent inflammation of the eyelids. This condition frequently occurs in people who have a tendency toward oily skin, dandruff or dry eyes. With blepharitis, both the upper and lower eyelids become coated with oily particles and bacteria near the base of the eyelashes. Everyone has bacteria on the surface of their skin, but in some people, bacteria thrive in the skin at the base of the eyelashes. Large amounts of bacteria around the eyelashes can cause dandruff-like scales and particles to form along the lashes and eyelid margins. Blepharitis is also associated with meibomianitis —a dysfunction and inflammation of the nearby oil glands of the eyelids (called meibomian glands). Warm compresses. Wet a clean washcloth with warm water, wring it out and place it over your closed eyelids for at least one minute. Repeat two or three times, rewetting the washcloth as it cools. This will loosen scales and debris around your eyelashes. It also helps dilute oil secretions from nearby oil glands, preventing the development of a chalazion (pronounced kuh-LAY-zee-un) — an enlarged lump caused by clogged oil secretions in the eyelid. Antibiotic ointment. Dr. Landa may prescribe an antibiotic ointment. Using a clean fingertip or cotton swab, gently apply a small amount at the base of the eyelashes before bedtime. Eyedrops. Artificial tears or steroid eyedrops may also be prescribed temporarily to relieve dry eye or inflammation.